I have to be honest; I’m not a huge fan of lamb. It is usually too gamy for my palate. 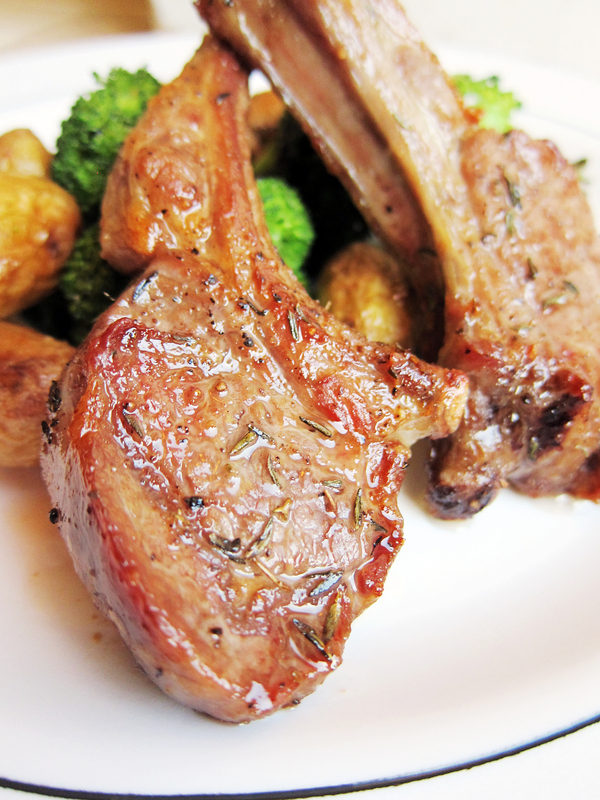 But, there is something about lamb chops that is so tender and delicious, I can’t resist them. Plus, they aren’t as gamy as other cuts of lamb. This is one of those dinners that are effortless but sounds fancy and plates beautifully. The only downside is that your oven has to be on. However, it’s been so chilly here in Jersey that the prospect of a warmer kitchen isn’t terribly off putting. Preheat the oven to 400˚F and on a sheet pan lined with aluminum foil, drizzle the potatoes with olive oil and season with salt, pepper and 1/2 tsp. granulated garlic. Put into oven to start roasting. 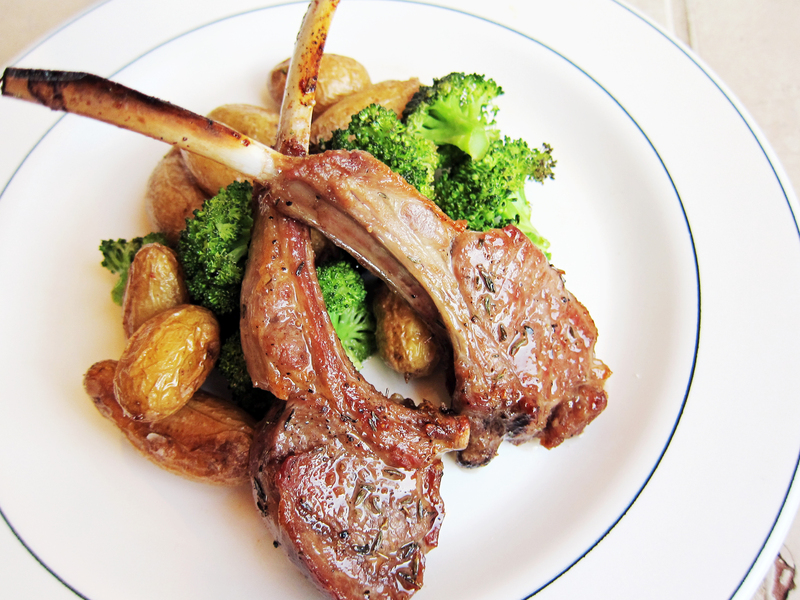 Divide the rack of lamb into individual lamb chops. 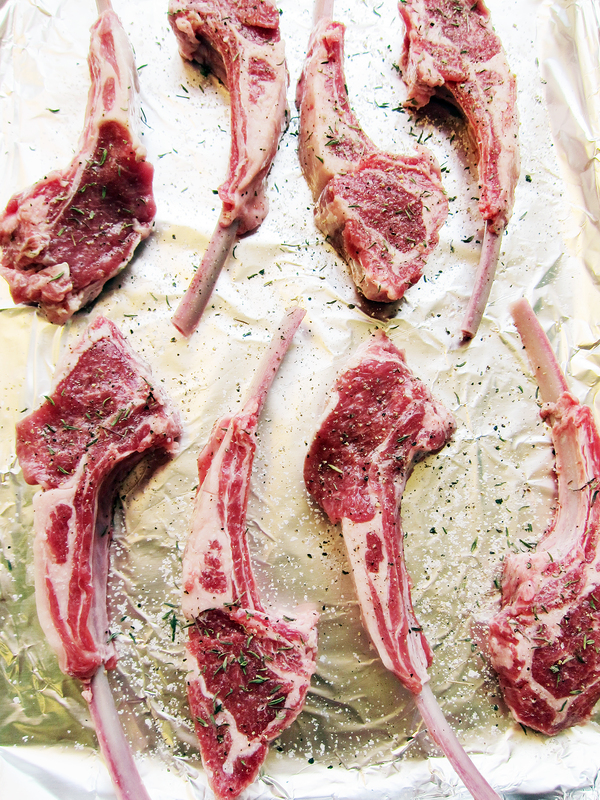 Arrange your lamb chops on a sheet pan lined with aluminum foil and season with salt, pepper and thyme on both sides. Add the broccoli to the pan and season the broccoli with the remaining ½ tsp of granulated garlic, salt and pepper. Place the pan back in to the oven. Broil the lamb chops 5 minutes per side, 10 minutes in total. Let the meat rest for about 10 minutes. 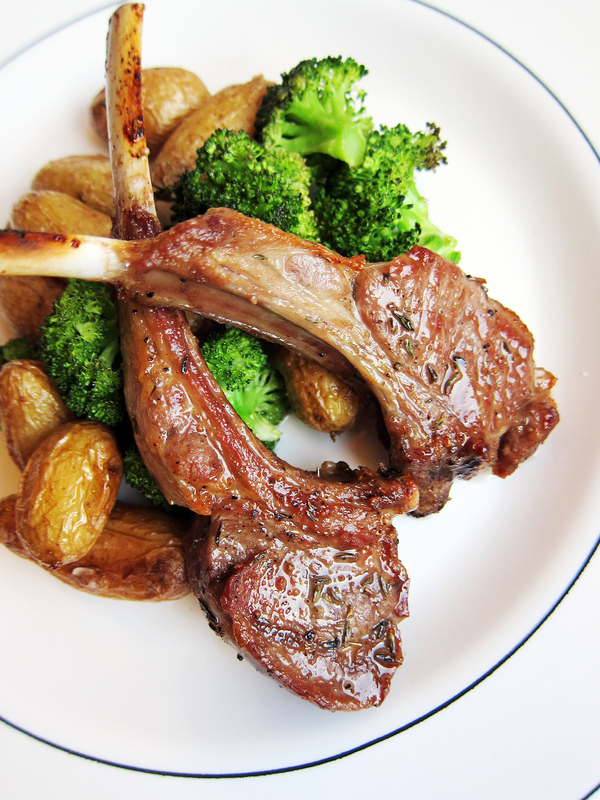 The potatoes and broccoli should be done at the same time as the lamb chops. If not, continue baking while the lamb is resting and check every 2 minutes. You want a knife to slide easily into the potato and the broccoli to be crisp tender. Arrange them on a plate and you’re done! * Buy them as small as you can get them for faster cooking. I get teeny tiny potatoes from Trader Joe’s and it’s the best thing for quick meals. ** I should note that I have a gas oven that has a separate broiling rack under the oven. This entry was posted in Dinner, Lamb, Meat, Simple Sundays, Vegetables and tagged broccoli, dinner, garlic, lamb chops, potatoes, simple, vegetables. Bookmark the permalink. This looks so good! Really, SO good! I love lamb and roasted potatoes! I agree about lamb! I can’t handle the gamey taste sometimes either but still enjoy it occasionally. My hubby made a delish rack of lamb for Easter. Today he was looking over my shoulder while I was scrolling through Insta and we both drooled when we reached your pic, these look so yummy! Oooo rack of lamb sounds delicious! It’s the best cut of lamb. I can’t stomach lamb shank 😞 thank you so much! good looking lamb.. you just need more of them! at least 5 a person!! Luckily, I don’t have that many mouths to feed. 🙂 But I agree, it’s so easy to eat lamb chops and they go by so fast! You always need more of those lovely meaty lamby lollipops! Oh wow, this looks like something I would order at a fancy restaurant, delicious! Thank you, Lily ❤ It really does look more fancy than it is!